A seven-year-old girl had to be airlifted to hospital after falling out of a bus that was taking her home from school. Her grandfather said she suffered a cracked skull and a bleed on the brain. The public bus had been travelling along Pier Road, Tywyn, after leaving nearby primary school, Ysgol Penybryn. Some schoolchildren use service buses as Gwynedd council only provides free transport for pupils living more than two miles away from their school. The girl is now receiving treatment at Ysbyty Gwynedd in Bangor. "She is walking around, doing everything. The doctors are trying to keep her under four-hourly observation," her grandfather said. "They're seeing if it settles itself. If not they will move her to [Alder Hey Hospital] Liverpool." He said the family was staying "very positive" and praised first responders, who were quickly at the scene making her comfortable, and the speed of the air ambulance. A Welsh Ambulance Service spokesman said it sent a community first responder after receiving a call at 16:02 GMT. The Wales Air Ambulance Service sent its Caernarfon-based aircraft at 16:42, with the Flying Welsh Medics treating a patient at the scene before taking her to Ysbyty Gwynedd. A spokesman said the crew left the scene at 17:17 and arrived at the hospital at 17:36. 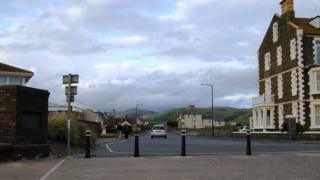 Gwynedd council said Ysgol Penybryn was supporting pupils and had been in contact with the family, and wished the girl "a speedy recovery". The bus company, Lloyd's Coaches, also wished the child well and said it was supporting police with its inquiries.